When a player starts their turn with an empty bag, they perform a ‘reset’ which primarily places all their used cubes back into their bag (plus any the player wishes to remove from their boards too) before they draw and take their turn. 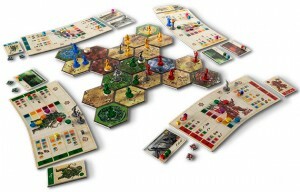 One technology allows a player to upgrade each colour of their civilisation. There is a separate track for each colour on their player board which players can advance, and a player can cash in their progress on any of these tracks to immediately add 1 or 2 cubes of the matching colour to their bag (if the track has been advanced enough). So, players get to decide which colours of cubes get added to their bag which adds a bit of a deck-building game mechanic but with cubes. 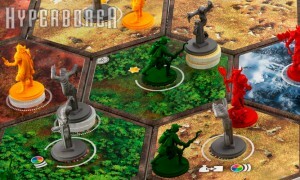 Moving around the board, players can explore ruins, attack and capture cities, and attack each other. The game ends when 1, 2 or 3 of the game end conditions are met (depending on the length of game that is being played). The winner is the player with the most victory points (VPs) which are earned for things like controlling territories, gaining advanced technologies and objective tiles, killing neutral figures and opponent figures, etc. There are various other elements too such as fortresses, advanced technology cards (which are special actions that are activated using cubes as normal but have special effects that only the technology’s owner can use), individual player abilities, etc. 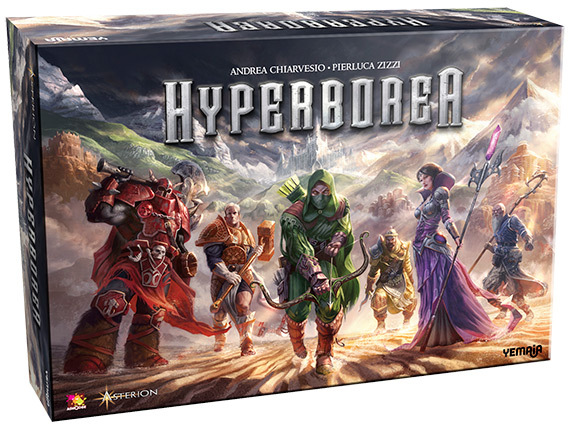 So, Hyperborea sounds like exactly my sort of game – a eurogame with a neat sounding game mechanic but with some meat. Also, I like that it’s a simplified civilisation game as I’m always interested in those (as I mentioned in my Nations Dice Game preview). I like that the cubes mean you don’t have every option available to you every turn, so you will need to work out how best to utilise the cubes you have based on your position and your opponents’ positions too. However, you can pre-plan your actions by loading up some cubes without completing them (although this will telegraph some of your plans to your opponents); however, pre-loading actions could even be used to send opponents a warning message, i.e. being ready to attack by adding 1 more cube). It will help if you can remember what colours are still inside your bag so you have more chance of starting the actions you’ll be able to complete quickly. The game plays 2-6 players. 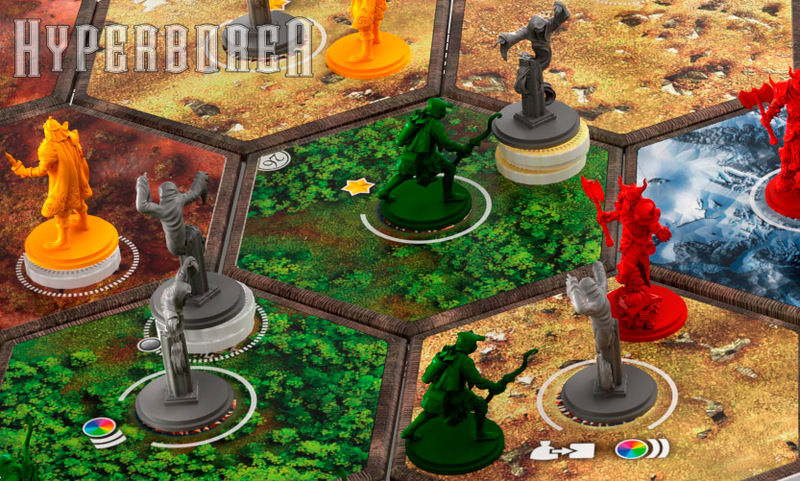 I have a suspicion that it may be quite chaotic with 5 and 6 players with a lot happening between your turns – but I find that happens in most 5- and 6-player games where player turns are sequential – so that’s not a negative. I can see a house rule of pre-drawing your 3 cubes so you can plan ahead of your turn (like I do with Carcassonne rather than wait until it’s your turn before drawing a tile) to speed things along. 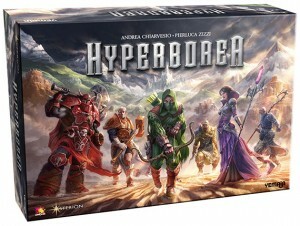 You can read the game details on Asterion’s website using this link: bga.me/hyperborea. This entry was posted on Monday, August 18th, 2014 at 1:34 pm	and is filed under Board Games, Essen Spiel 14, Hyperborea, Preview, Spiel 2014. You can follow any responses to this entry through the RSS 2.0 feed. You can leave a response, or trackback from your own site.